Have you ever printed a spreadsheet, then found it a few months later, only to wonder what the spreadsheet was for, what date it was printed, or what information you should be concerned with? This is very common, especially if you often print updated versions of the same spreadsheet. One way to resolve this issue it to use the name of the file in the header. 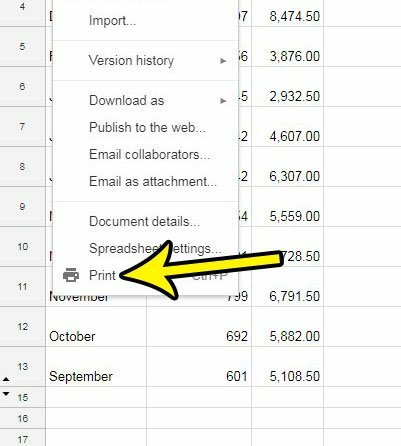 This adds identifying information to each page of the spreadsheet in the event those pages become separated, while also providing valuable information that can help you identify the printout later. 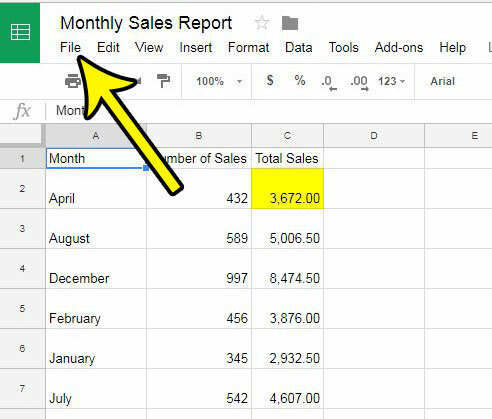 Our guide below will show you how to add the workbook title to the header in Google Sheets. 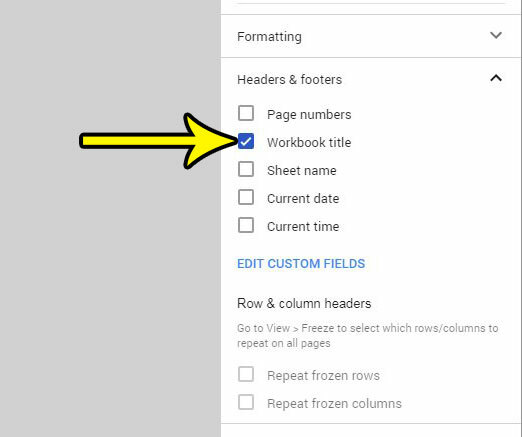 The steps in this article will show you how to change a setting for your Google Sheets workbook so that the title of the workbook is printed in the header, on every page of the spreadsheet. 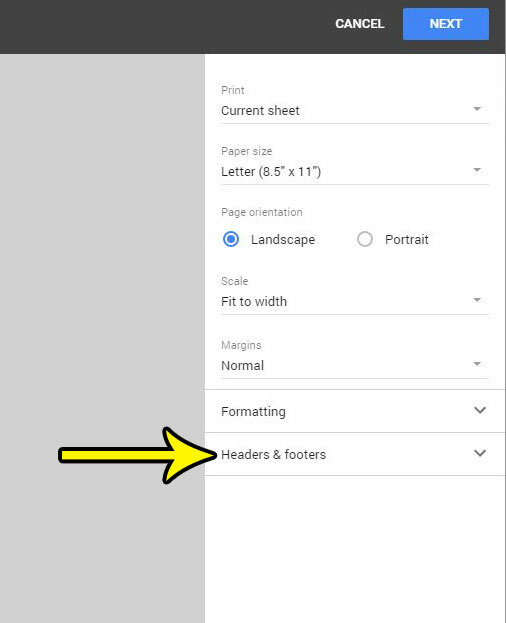 This setting only applies to the current workbook, so you will need to make this change on other spreadsheets for which you want to print the file name. Step 1: Go to your Google Drive at https://drive.google.com/drive/my-drive and open the file for which you wish to add the workbook name to the top of the page when printing. Step 3: Choose the Print option at the bottom of the menu. Step 4: Select the Headers & footers option in the column at the right side of the window. Step 5: Choose the Workbook title option. You can then click the Next button at the top-right of the window and proceed with printing your spreadsheet. Do you have fill color in your spreadsheet that you need to remove? Find out how to remove cell shading in Google Sheets if the current fill color is either incorrect, or no longer necessary.